Discover a new kind of clean with Gentle Cleansing Bar - an ideal alternative to soap! This unique cleansing bar has everything you could want: rich, creamy lather, mild cleansing agents and 32% moisturizers! You’ll love the way this soap-free bar glides across your skin, gently and thoroughly cleansing your face and body. Perfect for sensitive skin. Lasts long, rinses easily and leaves the skin feeling fresh, clean and satiny smooth. Ingredients: Disodium Lauryl Sulfosuccinate, Sodium Cocoyl Isethionate, Cetearyl Alcohol, Corn Starch, Stearic Acid, Hydrogenated Castor Oil, Glycerin, Water, Sodium Trideceth Sulfate, Cocamide, MEA, Cocamidopropyl Betaine, Titanium Dioxide, Mineral Oil, Fragrance. To cleanse your face effectively without stripping the skin’s necessary moisture-retaining lipids. To clean thoroughly with a rich, creamy lather without irritating even the most sensitive skin. To remove environmental grime and pollutants that gradually build up on your skin, especially in urban or industrial settings, around smokers, or any place the air is stagnant. To cleanse without the use of harsh or drying soaps that can also upset the pH balance important for a healthy skin surface. 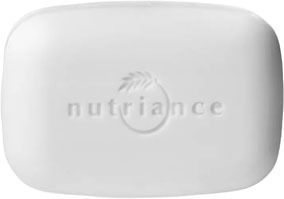 Why Nutriance Gentle Cleansing Bar? An ideal soap-free cleansing bar alternative. Clinically proven to be non-irritating. Perfect for those with sensitive skin. Mild cleansing formula clears away skin surface debris as it delivers moisture. Contains 32% moisturizing ingredients! Rich, creamy lather for luxurious yet thorough cleansing of face and body. Free-rinsing formula leaves skin feeling soft and satiny smooth. Gentle, water-soluble cleansing bar helps maintain a healthy skin surface pH. The Nutriance Personal Care line delivers salon-quality performance from luxurious body care products you can enjoy at home every day. Clinically tested in Europe’s most prestigious dermatological research facility.